Paddleboarding, stand up paddling, stand up surfing or SUP for short, involves standing on a large board and propelling yourself along with a single bladed paddle. Many people think it's a new watersport...but it's not! Paddleboarding has a hawaiian heritage and translates in hawaiian to Ku Hoe He'e Nalu; to stand, to paddle, to surf, a wave. It's history dates back to the 1950's when the beachboys (surf instructors) on waikki beach, used to stand up and paddle out to the surf break using their regular surf boards and a one bladed paddle. They did this because, the higher view point offered by the sup style provided better visibility of their group and incoming swells. Also, it allowed them to keep their wealthy customers camera dry and take pictures of them surfing!! As surfing developed and fashions changed, the paddle was lost and only a few surfers in Waikki continued to stand on their board and use a paddle. However, in the early 2000's the paddle made a return to surfing when Hawaiian surfers such as Dave Kalama, Brian Keaulana, Rick Thomas, Archie Kalepa and Laird Hamilton started paddleboarding as an alternative way to train and keep in shape, while the surf was down. And the sport has continued to develop since then. Today, due to modern technologies and designs, paddle boards are lighter and more maneuverable, and paddles are lighter and more powerful. This has enabled paddleboards to have a much broader use e.g. 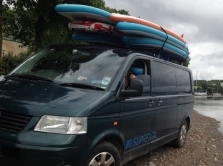 surfing / flat water cruising / racing / white water paddling/ fishing / all round paddling and for just having fun on! There are now many different types of paddleboards on the market for people to choose from, to suit their paddleboarding needs. e.g race SUPs, wave SUPs, all-rounder SUPs, fishing SUPs, ocean rescue SUPs etc... What you choose to do on your SUP is up to you! With a Red Air Inflatable SUP you can take them anywhere and paddle everywhere, without any hassle or transport issues. They're easy to use and therefore a perfect SUP for all the family. Try the worlds fastest growing watersport...it's great fun.